To everybody's surprise, India's most tracked equity indices, S&P BSE Sensex and CNX Nifty 50 are heading towards their lifetime highs. 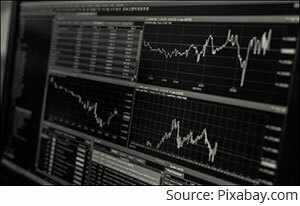 The indices started their up-moves at a time when the experts were predicting a market breakdown. Now they are 'cautiously optimistic' about the scope of this rally. Markets have once again proved - timing them isn't an easy task, so it's better not try. Throughout 2018, intelligent investors showed faith in their personalised asset allocation. They kept investing in equities through Systematic Investment Plans (SIPs) undeterred by the topsy-turvy market movements. As a result, they have no regrets when markets are witnessing a strong surprise-rally, which most of the perturbed investors have missed. If this rally has any further steam left in it, then mid and small cap mutual funds is the place to be for intelligent investors now. Many of them had switched to large cap and multi cap funds when the markets had threatened to take away years of profit in 2018. It's time to go back to the original allocations. Of course, this goes without saying, you must consider your risk appetite and financial goals before making any such switch. S&P BSE mid cap index: Is worst over? 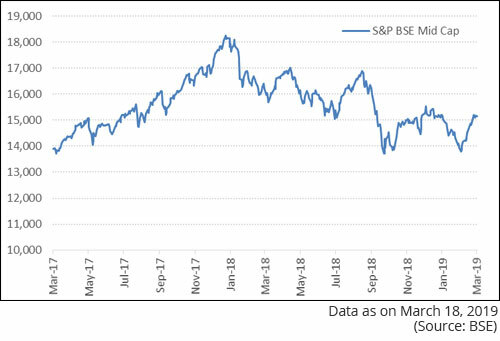 Between 8th January 2018 and 9th October 2018, S&P BSE Mid Cap Index lost 24.9%, but from the lows it has bounced back 10.5%. Valuations measured by Price-to-Earnings (PE) multiple have cooled off from 37X to 32X over the last one year. The fall was severe in the S&P BSE Small Cap Index. Between January 15, 2018, and February 18, 2019, the index lost 35%, but within a month it staged a 13% rally. 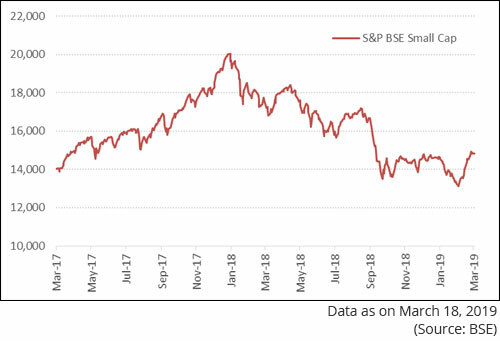 S&P BSE small cap index: Out of woods? Valuations in the small-cap space too have become selectively reasonable. 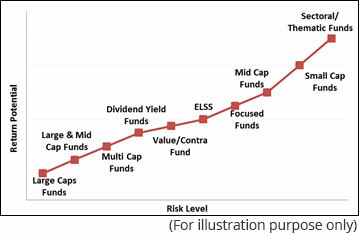 How have mid cap funds and small cap funds performed? Over the last one-year, mid cap funds generated -3.5% returns on an average; whereas the small cap funds incurred 10.5% losses on an average. But, in the five-year time frame, mid cap funds generated an average 20.4% compounded annualised returns while small cap funds yielded 22.5% compounded annualised returns. This goes to show; mid and small cap funds can reward investors handsomely provided they are ready to ride out bouts of extreme volatility. All of them have generated above-average returns in their respective categories. Mid and small cap funds can generate superior returns in the long run. Hence you shouldn't ignore them when they are making losses. According to the market capitalisation list published by AMFI (Association of Mutual Funds in India), a six-month average of the market capitalisation of the largest mid cap company was Rs 27,944 crore as on December 31, 2019. And Rs 8,590 crore for the smallest mid cap company on the same day. In other words, the universe of 150 mid cap companies is reasonably large for institutional trades. Once valuations in the large cap companies start appearing stretched, the rally may percolate to mid cap companies provided there's a valuation edge and there isn't any adverse event that may dampen the investors' sentiments. The market capitalisation of 100th largest small cap stock (or 350th stock of all-cap list) had an average market capitalisation of Rs 4,704 crore as on December 2018. Global and domestic macroeconomic environment would play a vital role if investors were to loosen up their purse. If investors sense lucrative opportunities, mid cap and small cap stocks may witness rallies. Valuations would look more comfortable if companies report better earnings in the forthcoming quarters, possibly another positive. If you are keen on investing in mid cap and small cap funds, you should be equally concerned with the selection of a fund. Don't forget to choose a direct plan to accelerate your long term returns. PS: If you want to add SOLID mutual funds to your portfolio that could help you create wealth in the long run? But don't have time and skills to select worthy mutual fund schemes; don't lose heart. PersonalFN's unbiased premium research service-FundSelect is meant to assist investors in selecting worthy mutual fund schemes. PersonalFN's FundSelect has 15+ years of an impeccable track record. FundSelect has been based on one simple motto: "Be steady. Be alert. Be winning." With FundSelect, you get access to high quality and reliable funds picked by our research team using their comprehensive S.M.A.R.T. score fund selection matrix. So if you are serious about investing in a rewarding fund, try PersonalFN's flagship mutual fund research service FundSelect. Every month, PersonalFN's FundSelect service will provide you with an insightful and practical guidance on equity funds and debt schemes - the ones to buy, hold, or sell, therefore assisting you in creating the ultimate portfolio that has the potential to top the market. Subscribe to FundSelect today! Equitymaster requests your view! Post a comment on "Here's Why The Time Is Ripe To Invest In Mid-And-Small-Cap Funds Now". Click here!